The population of Ellsworth was listed as 396 in the 1900 census. The following paragraph is taken from a 1900 edition of the local paper. When Cares Overtake You, Come to Ellsworth and Smile. Ellsworth is located in the rosy end of Hamilton county, and Hamilton county is in the garden spot of the universe. About 500 inhabitants make up the town and they are all people that can be depended upon to do as they agree. There are no get-rich quick artists here. No one here need worry about the high cost of living as the merchants all work the “small profit and quick return” business method, and by so doing, have gained the confidence of their customers so it is unnecessary for them to compare their prices with those of the catalogue houses. Rent is very reasonable, considering the scarcity of houses and with an up-to-date water system, three churches, a first grade school, and no saloons, the town is certain to prosper. There are no “blind pigs”, no disreputable characters, yet no one is in the would-be angelic class. If you want to live in a town where everybody smiles, COME! Click to view advertisements published January 25, 1900 in the Ellsworth Chronicle. 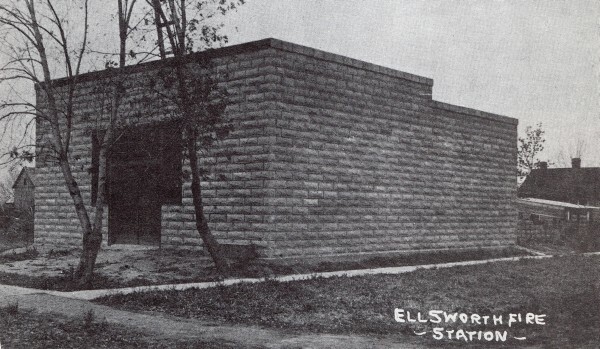 The first Ellsworth Fire Station was built in the early 1900s. It was used as a city hall, fire station, water works with a 30,000 gallon tank on the north side of the building. There were two wells and an electric light plant. The first fire hydrants in town were installed in 1910. This Fire Station was dismantled and replaced by a newer one in the 1930s. As early as 1885, a cistern system designed to help put out fires in the town of Ellsworth was dug at different points on the east side of Main Street. One large cistern was dug in fromt of lot 25, blick 4, another in front of lot 28, block 4, and the third cistern in lot 11, block 5. The water was pumped by hand for fire purposes. The early system was called the fire brigade. 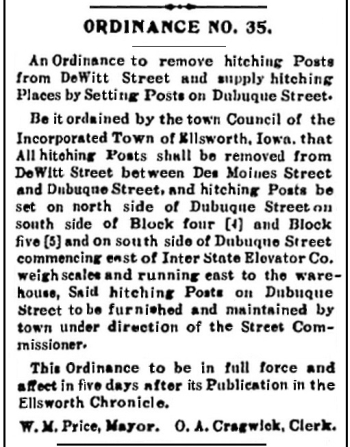 Click the above Ellsworth Chronicle paper header to see a page of advertisements found in a 1902 Ellsworth Chronicle. maintained by town under direction of the Street Commissioner. 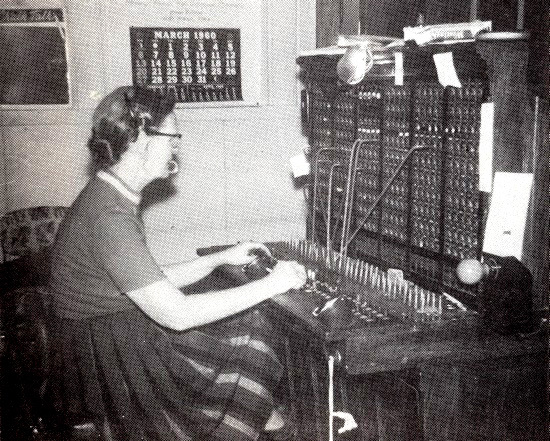 Ida Fjetland was seen at the switchboard from 1919 through 1966. 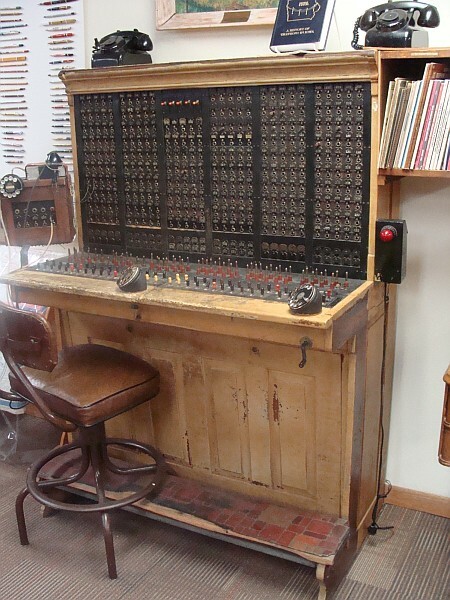 This telephone switchboard may be seen in the History Room of the Ellsworth Library. Read the rest of the story of telephones in Ellsworth. This structure would later be used for use as the Ellsworth lumber yard. 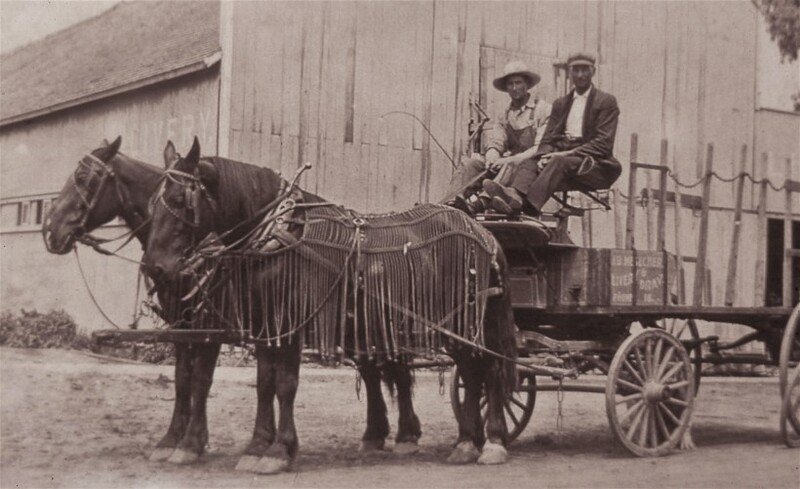 and dray wagon ready to pick up freight to haul to the railroad station for shipment. 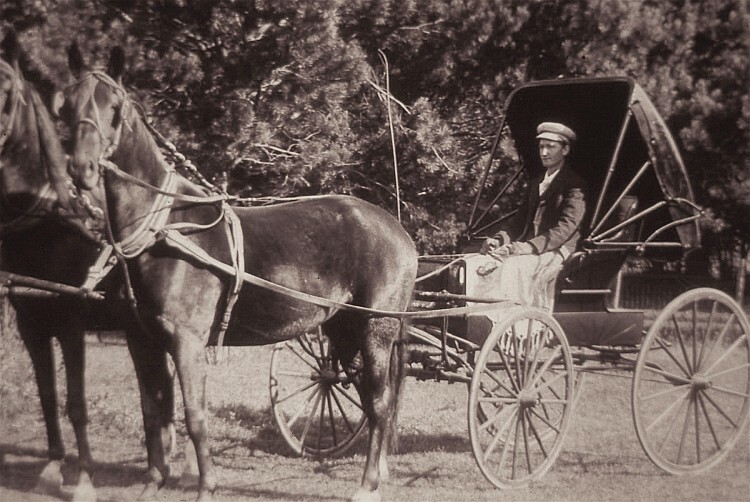 It was in 1911 that Jesse Johnson, owner and driver of his team with a new rubber-tired buggy, had this picture taken at his father's farm, later the farm of Philip Hemphill. 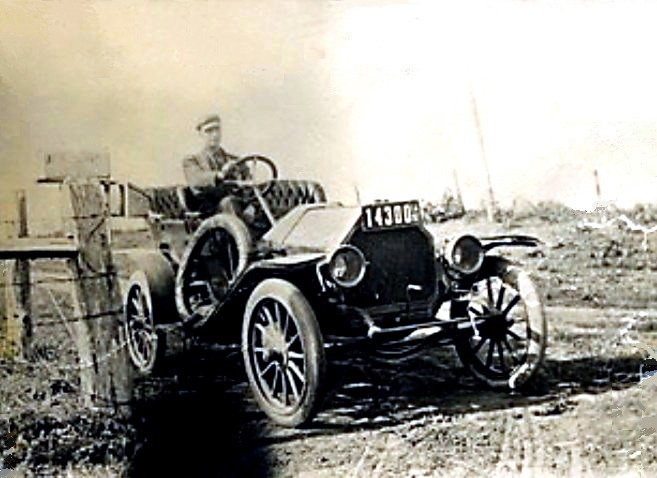 The earliest automobile in Ellsworth was in 1901, when Will Hanson drove a car from Linsing, Michigan to Ellsworth. It is told that in order to secure gas for the operation of his car, he had to siphon gas from a barrel. Harold Keesee was Ellsworth's rural Mail Carrier 1901-1933. 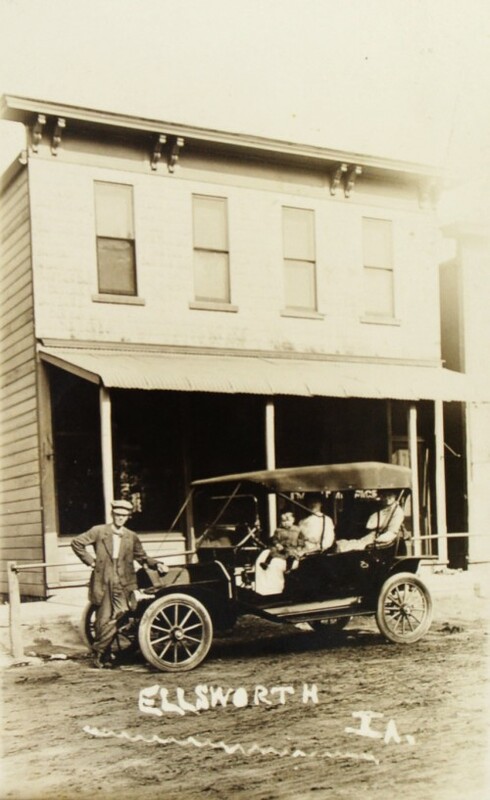 This Ellsworth image of an early car in town is from an old postcard. The next page shows more early images.